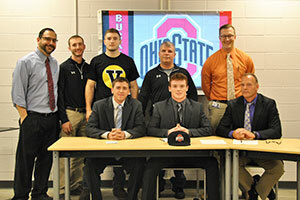 Ryan Ferro, Warwick senior three-sport standout (football, wrestling, baseball) has signed a National Letter of Intent to attend Ohio State University and compete as a wrestler for the Ohio State Buckeyes. 6-Year Varsity Career Record of 184–36 (Never Lost a Home Match), 37–0 in senior year. Ryan was recruited by Anthony Ralph, Assistant Coach at Ohio State University. Ohio State has an undergraduate enrollment of 66,046 students, and competes in the Big Ten Conference along with Wisconsin, Penn State, Michigan and Michigan State (five additional schools). They were Big 10 and National Wrestling Champions in 2015. The team’s most accomplished wrestler is Kyle Snyder (285 lb. National Champion 2017). Ryan’s family includes his proud parents Ray and Susan Ferro, brother Mike Venturino and sisters Jill and Nikki Ferro. Click here to view Ryan Ferro’s photo album on the district’s public Facebook page.